Grease the crock with the olive oil. Add the chicken and BBQ sauce. Cover and cook on High for 4 to 5 hours or on low 7 to 8 hours. The last hour it's cooking I prepare 3 boxes of Mac 'N Cheese and get some green beans (or other vegetable) on to boil or steam. When the Chicken is done it's ready to serve! I think it tastes best to put your pasta on the plate first. 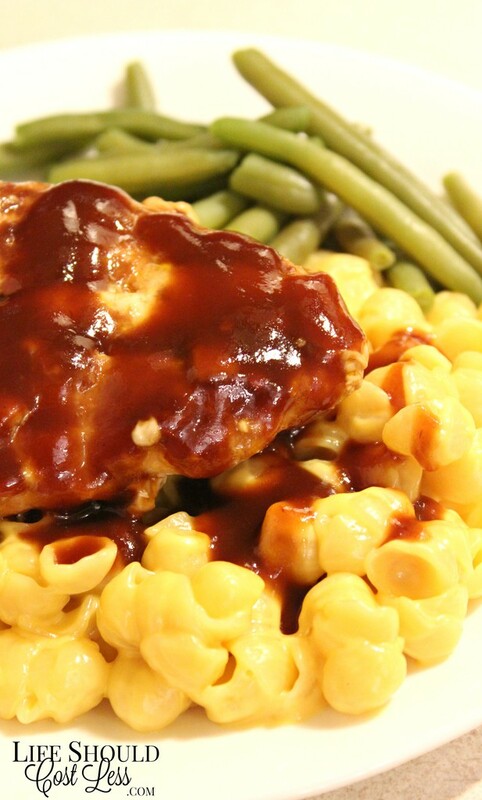 Your chicken on top of it, and then to drizzle more BBQ sauce on top! I like to make enough BBQ Chicken so that I can make BBQ Chicken Sandwiches the next day for lunch. I just take the crock from the fridge and put it on High for about an hour before we're ready to eat. Remove the chicken, shred it, mix it back in and you're ready for the next meal.